Lulus Lovlies: Cottage Colors Party for April "Pink"
Today I'm joining the Cottage Colors Party and the color of the month for April is Pink! This is a Chintz tea cup and saucer that I just love (Chintz is my favorite in china) and while putting away my few Easter decorations I had out, I was reminded that today is the 4th Monday of the month and it was time again for the Cottage Colors Party. I joined in a couple of swaps this past month and one of them being Cindy's of ThimblePrims Studio for her ThimblePrims Easter Egg Swap and this is one of the eggs I received and the egg part is under her skirt. I just love this one and she is in Pinks too. I think she looks great in the Tea Cup as all the colors coordinate so it became an instant share! I hope you all had a wonderful Easter yesterday and are looking forward to Spring! I also love chintz!! This is gorgeous, and your swap gift is also awesome!!! I love this party! I would love to join SOMEDAY!!! I am going to need a few weeks to gather my thoughts and create. I am missing it!! Hello, Happy Pink Saturday! I'm still making PS visits. Love your pink post this week. This is the prettiest tea cup I've ever seen! Thank you so much for stopping by and leaving a sweet comment. 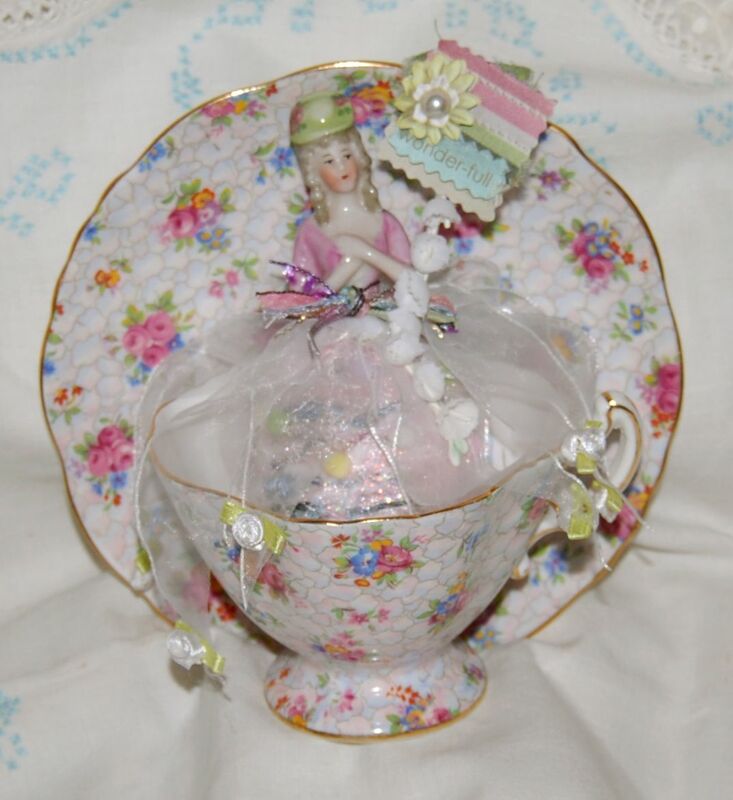 She is perfect for your chintz teacup! Marilou, Absolutely charming tea cup/saucer just waiting for a spring tea.